Wikileaks mystery: How did town hall question get to Clinton campaign? Interim chair of the Democratic National Committee Donna Brazile delivers remarks on the second day of the Democratic National Convention. How did the text of a CNN-TV One town hall question about the death penalty end up in the hands of the Clinton campaign ahead of time? New evidence on Wednesday suggests that TV One co-host Roland Martin may have been the link from the town hall prep process to the Democratic National Committee. In a hacked email published by Wikileaks, Democratic National Committee official Donna Brazile appeared to tell Clinton campaign communications director Jennifer Palmieri that "from time to time I get the questions in advance." The March 12 email foreshadowed a question asked by TV One host Roland Martin at the March 13 town hall. 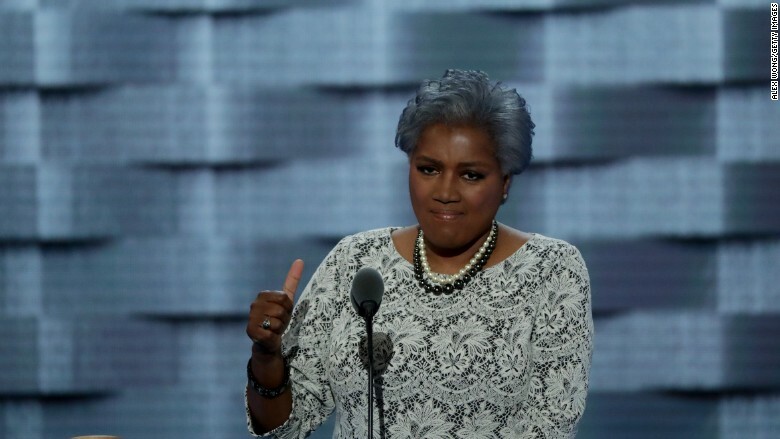 Brazile was both a DNC vice chair and CNN political commentator at the time. But CNN flatly denied any coordination. "We have never, ever given a town hall question to anyone beforehand," a CNN spokeswoman said. Martin did not deny sharing information with Brazile. Instead, when asked by CNNMoney on Tuesday, he said "my questions were shared with my executive producer and several members of my TV One team." When asked in a followup question if he would explicitly rule out any sharing of questions with Brazile, Martin did not respond. Wednesday afternoon, Politico's Hadas Gold reported on an email she obtained that Martin sent to CNN producers the day of the town hall. The email "shows him using word for word the language of a question that Brazile appeared to have sent to the Clinton campaign a day earlier," Gold wrote. In a statement, a CNN spokeswoman said, "As we have said since news of this broke, CNN did not share any questions with Donna Brazile, or anyone else for that matter, prior to the town hall. Given that our broadcast partners for the town hall at TV One sent this question to us the day AFTER it appeared in Donna's email, we have every reason to believe it came from them." Apparently responding to Gold's report, Brazile tweeted Wednesday afternoon that Martin "is a solid professional, good, tough no nonsense journalist. I'm sorry that he's being accused of such non sense. Apologies." Martin has not responded to requests for comment from CNNMoney Wednesday. In a telephone interview with CNNMoney on Tuesday, Brazile said she was choosing not to view any of the emails stolen by Wikileaks. "This is exactly what the Russians intended to do. And they're doing it," she said. Brazile emphasized that "I had no access to any questions" for any debate or town hall. Brazile became the interim chair of the DNC in July after Debbie Wasserman Schultz resigned. At that point, her commentator deals with CNN and ABC were suspended. She now leads both the organization's response to cyberattacks and its campaign efforts. A political commentator like Brazile would never be in the room during debate or town hall planning sessions. CNN reporters and producers typically prepare in what is informally known as the "cone of silence." Secrecy is prioritized and access is restricted during the prep sessions. But Brazile's March 12 email to Palmieri included the text of a potential question about the death penalty. A similarly-worded question was read by Martin at the town hall the next day. He introduced an exonerated former death row inmate who asked Clinton about her view on the matter. The town hall itself was unusual -- it was a joint production of CNN and TV One, a cable channel targeting African American viewers. Both Clinton and Bernie Sanders participated in Ohio. Martin moderated for TV One and Jake Tapper moderated for CNN. Martin said Tuesday that the questions he drafted were "designed for both candidates. It wasn't until we met on Sunday that some of the questions were kept and others discarded." As for the email itself, Palmieri replied by starting a new email chain to share Clinton's talking points about the topic. "That sequence suggests that Brazile may have been forwarding the question for her own purposes — that is, to be prepared for some panel discussion about the death penalty. If so, it shows just how faithfully a CNN contributor seeks to toe the Clinton line," Washington Post media critic Erik Wemple wrote Tuesday. Wemple and other journalists immediately raised questions about Brazile's complicated relationships. Commentators like Brazile are not journalists, but they appear on the air to share political perspectives and insights. New York Times reporter Nick Confessore said the email exchange is a "good argument against having campaign surrogates on staff at your network." Tuesday's revelation came from a trove of hacked emails published by Wikileaks. The emails came from the account of Clinton campaign chair John Podesta. The Clinton campaign and the DNC has strongly objected to the release of the emails and has blamed Russia for cyberattacks "aimed at interfering with our election." Other emails published by Wikileaks have shown more mundane interactions between campaign aides and journalists. In some of the emails, Clinton aides speak bluntly and negatively about journalists from CNN and other outlets. In a June 23, 2015 email, Podesta asks, "Why is Jake Tapper such a" and uses an explicit term for the male anatomy. Tapper had asked for an hour-long interview with the candidate. Palmieri replied and said "That is the right question." Tapper picked up on the email and shared it with his Twitter followers last week.